Conventional Pharmacies that fill prescriptions by licensed pharmacists are governed under Section 503A of the Compounding Quality Act (in effect as of October 2014). Under 503A, state boards of pharmacy can continue to oversee and regulate pharmacy practices, including the compounding of sterile preparations. These compounding pharmacies will continue to be required to meet the guidelines set forth in USP <797>. A pharmacy that elects to operate under the guidelines of Section 503A must meet traditional sterile compounding guidelines for their facility, though these can be interpreted differently from state to state (For instance, some states require performance in accordance with a recent advisory requiring the use of the “Gap Analysis Survey,” a checklist for risk analysis, while others do not). A private patient consultation area that is available without traversing stockroom or dispensing areas. A prescription area of minimum 300 sf. Equipment as required by USP. Various other paper record and related items. A sink near prescription filling area. Minimum work area of 72 sf. Closed on all sides except for a door and a passage opening. Continual positive pressure except if hood is self-venting. Located directly adjacent to prescription area. Many state agencies also strongly advise the need for touch free doors, touch free hand sinks, non-wood doors and an airlock for doors opening into negative pressure areas (an anteroom can serve as an “air lock”). The challenge with compounded preparations is ensuring that the solutions or drugs to be administered are made in sterile conditions that conform to current Good Manufacturing Practices (cGMP's). This requires the utilization of specific equipment and protocol including specialized air filtration, properly garmented workers and regimented QC testing. Aside from the equipment and validation processes, one must also stay familiar with current regulations and standards. 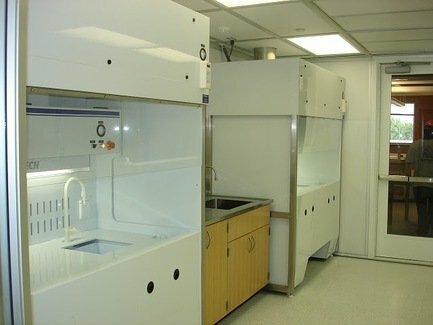 PortaFab specializes in the turn-key design and construction of modular clean rooms including applications specifically requiring USP <797> compliance. Our in-house team of engineers and designers will provide assistance with the design and qualification process, while our nationwide network of local distributors will complete the construction and installation of your new enclosure. We will be happy to provide a customized quote based on your specific requirements and application. Please fill out our Request a Quote form in order to get the process started.